The office features an intimate, clean, warm, inviting space where the context of play is used to address your child’s challenges. State-of-the-art suspended equipment designed by Ms. Tolin provide novel obstacle courses and challenges that are ever-changing, giving the children the wonder and joy that “everything is new” each week. 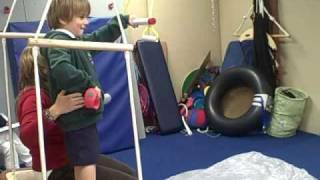 Toys and games are carefully selected to facilitate motor development, cognition and social skills. 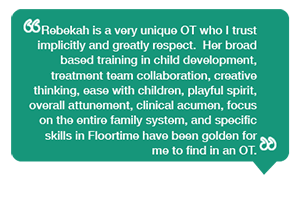 Rebekah Tolin, OTR/L is a dynamic pediatric occupational therapist in the Los Angeles area. Children are seen in a fun gym environment where parents are welcome to attend. Private rooms, individualized treatment, ongoing support and warm relationships are the core of our practice. Ms. Tolin harbors a wealth of knowledge regarding schools in the Los Angeles area. Her clients often benefit from in-depth conversations about the many schools where she has had clients, has lectured, knows the directors and/or staff, and has toured. For a detailed list regarding the knowledge base of Ms. Tolin, please see this list. Ms. Tolin has partnered with Foundation ThinkAgain to enable children with late effects from radiation and chemotherapy to receive Occupational Therapy intervention free of charge to the family. Won “PTA Mommy” Mommy Award. 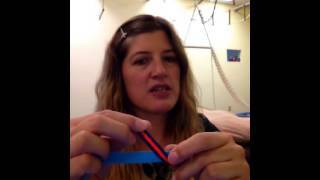 Produced by The Pump Stationand Nurtury and MomAngeles Media LLC. Over 4,500 votes cast in Mommy Awards in LA last year. Ms. Tolin worked in Colorado hospitals in acute care, including Trauma/Burn Unit, Bone Marrow Transplant Unit, Rehabilitation Unit, maternity ward, and alcohol/drug detoxification unit. At Colorado State University, received Advocacy Diversity Award Scholarship and Outstanding Effort Award from CSU Office of Resources for Disabled Students.